Hemochromatosis is a genetic condition of too much iron in the body. Learn how holistic diet and natural remedies can help your symptoms of iron overload. However, this condition of iron overload is massively under-diagnosed or mis-diagnosed and thus numerous people have the condition and do not know it. In fact, estimates show 1 in 9 people of Northern European descent are carriers of the HFE gene mutation that can cause this disease of iron overload and 1 in 200 carry two genes. Two copies of the C282Y hemochromatosis gene is the most likely mutation to cause symptoms. These individuals are called "homozygous carriers"-- and their health may be very seriously at risk due to too much iron. A combination of the C282Y gene with a mutated H63D gene may possibly express symptoms of the disease. The term for this condition is called "compound heterozygote." Many resources will tell you that people with only one copy ("heterozygous carriers") of the HFE gene are unlikely to express any symptoms or problems. However, this may not be the case! Over the years, countless people from all over world who are hemochromatosis carriers have told me their symptoms of too much iron even with a single copy. The bottom line is this: excess levels of iron may compromise your health if it is not identified soon enough or treated properly. Fortunately, there is much that can be done to help! Just what is hemochromatosis, after all? Because you are reading this page, it is likely that you or a family member have been diagnosed with this condition of iron overload. It is also possible you are having a hard time pronouncing, or even spelling, hemochromatosis! Hemochromatosis is a genetic metabolic disorder of too much iron absorption during digestion which may lead to iron overload in the cells of the body. While blood levels of iron may be elevated, the primary problem stems from the accumulation of iron in the body's cells, tissues, and organs. The process of iron overload is typically slow to develop and may not affect a person's health until they are in their 30s, 40s, or even their 50s or 60s. The symptoms of hemochromatosis can range from mild to severe, and the disease itself can be fatal if it is not identified in time. For most people the condition of iron overload is genetically inherited, thus why it is often referred to as Hereditary Hemochromatosis (HH). As a genetic condition, it is very important that family members of an affected person get tested for their iron levels and genetic markers. ** Note- The primary emphasis for this site will be on the Type 1, HFE gene mutation because it is the most common cause of iron overload (approximately 90% of cases of what is hemochromatosis). HFE, C282Y, H63D, and S65C... oh my! Type 1 Hemochromatosis is the result of a mutation to the HFE Gene, located on Chromosome 6. The term for "HFE" is kind of creative, and it stands for "High Iron." Iron's chemical symbol is Fe... thus HFE. See the creativity? This gene codes for a protein involved in iron absorption, and when mutated, causes the body to take in excess iron from food and water. Genes often have alternative forms of expression, called alleles. Different alleles can lead to different traits (like hair or eye color), but alleles can also mutate and create "missense" proteins. This change in the DNA is permanent, and can be passed down through the generations. Homozygote --> 2 copies of C282Y. Most likely to be severe. Compound Heterozygote --> 1 copy of C282Y + 1 copy of H63D. 2nd most likely to be severe. Heterozygote --> 1 copy of C282Y (or 1 copy of H63D). Least likely to be severe. Doctors will often state that clinical hemochromatosis is only found in individuals homozygous with two C282Y mutations. As a result, many people that are compound heterozygous or heterozygous may be told that they don't have iron overload and that there is no reason for them to treat this condition. Yet estimates still show 15.3% of individuals expressing the compound heterozygote or heterozygote copy of Hemochromatosis DNA have clinical symptoms (from the American Journal of Epidemiology titled, HFE gene and hereditary hemochromatosis: a HuGE review. Human Genome Epidemiology). If you are a hemochromatosis carrier, your health may be at risk due to a degree of iron overload. Clearly there is a disconnect in how to define "what is hemochromatosis." I have personally experienced symptoms from having too much iron and I have worked with and communicated with many people who also suffer from an excess of iron in spite of "only" having one mutation. As a result, I see a benefit in supporting the health of individuals who are either heterozygous or homozygous. A diagnosis of hemochromatosis may happen in several steps. Even though iron overload is a very common genetic disorder, many people go years or decades before they find out they have it. Many doctors may not consider hemochromatosis in their diagnosis because they are thinking about other conditions that may have a similar presentation, such as arthritis, menopause, or general fatigue caused by any number of “normal” reasons. It is essential, however, that they be thorough and include iron overload in their differential diagnosis thought process. Furthermore, the signs and symptoms of iron overload are often different for women and men. This may affect diagnosis because a doctor will have to account for the different ways a man or a woman may experience hemochromatosis. Even though there are a number of individual and gender differences in iron overload, doctors can still come to a diagnosis of hemochromatosis based on a number of tests. There is a progression of testing when it comes to diagnosing iron overload. When it comes to blood tests, some markers that represent the level of iron in the body fluctuate relatively quickly (for example, serum iron). 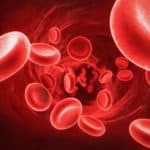 A one time test of slightly elevated serum iron is not enough to diagnose hemochromatosis, as there are other reasons that might cause iron levels to be elevated, such as inflammation or infection. Hereditary hemochromatosis can be difficult to diagnose. Early symptoms such as stiff joints and fatigue may be due to conditions other than hemochromatosis. Many people with the disease don't have any signs or symptoms other than elevated levels of iron in their blood. Hemochromatosis may be identified because of abnormal blood tests done for other reasons or from screening of family members of people diagnosed with the disease. To understand the progression of diagnosis, let's start first with blood tests. The two most important tests to begin with in potentially diagnosing iron overload are transferrin saturation and ferritin. Some doctors prefer to do these tests separately from one another, and some doctors like to do these tests together, so your experience will likely depend on your physician’s preferences for blood testing. Serum transferrin saturation. This test measures the amount of iron bound to a protein (transferrin) that carries iron in your blood. Transferrin saturation values greater than 45 percent are considered too high. Serum ferritin. This test measures the amount of iron stored in your liver. If the results of your serum transferrin saturation test are higher than normal, your doctor will check your serum ferritin. Regarding ferritin, I will add to the Mayo Clinic’s description that elevated ferritin levels reflect stored iron in a number of organs, like the spleen, bone marrow, brain, joints, etc., not just the liver. While ferritin levels are frequently highest in the liver, ferritin is certainly not limited to only the liver. Personally, I think of ferritin as representing the body’s cellular burden of iron. This is the most straightforward way to characterize iron inside our cells. Another consideration is that a number of other conditions besides hemochromatosis can cause an elevated ferritin level. Inflammation, infection, and liver disease are other common reasons that ferritin levels rise. Your physician will understand this, and should take it into account when diagnosing you. High transferrin saturation is the earliest evidence of hemochromatosis; a value greater than 60% in men and 50% in women is highly specific. Approximately 30% of women younger than 30 years who have hemochromatosis do not have elevated transferrin saturation. Women in their early 20s have written to me about their stories, and a common theme is that they went years without proper diagnosis in spite of having symptoms of hemochromatosis. Being young may have something to do with this, but I’ve also seen how there are many misconceptions of how hemochromatosis affects women differently than men. Serum ferritin levels elevated higher than 200 mcg/L in premenopausal women and 300 mcg/L in men and postmenopausal women indicate primary iron overload due to hemochromatosis, especially when associated with high transferrin saturation and evidence of liver disease. If transferrin saturation and/or ferritin are elevated, the next step in hemochromatosis diagnosis is often genetic testing. Genetic testing often entails another blood draw, although some lab companies offer a test that involves swabbing the inside of your mouth to collect cells to test. Both tests are evaluating the DNA for possible changes of the HFE gene, specifically for the C282Y, H63D, and S65C alleles. Once a physician has evaluated a person’s signs and symptoms, his or her transferrin saturation and ferritin levels, and the genetic test, a diagnosis of hemochromatosis may be made. Should my family members get tested for hemochromatosis? Because hemochromatosis is hereditary, the question next turns to the family members. Should any other blood relative family members be checked? What about children? Family members identified as having C282Y homozygosity should be tested for transferrin saturation, serum ferritin, and liver enzymes; screening of young children of patients with hemochromatosis does not need to be performed if the spouse is tested and does not have the C282Y mutation. Early awareness is essential. The sooner a person with iron overload can be diagnosed, the better. Treatments are abundant, and outcomes are better when started earlier. As a result, consult with your doctor and please tell your family about hemochromatosis! Hereditary hemochromatosis causes a progressive loading of iron over time. For individuals with the most severe cases of iron overload, they can suffer from permanent damage like scarring or cirrhosis of the liver which can, in turn, lead to liver cancer. In certain situations, the prognosis can be dire. Iron overload can progress to the point where symptoms and damage is irreversible. As a result, it is crucial to identify and diagnose hemochromatosis early. Therapies such as therapeutic phlebotomy and medication can have profound healing effects. We just have to catch it as early as possible, so we can take all the steps necessary to prevent the buildup of too much iron. Be sure to talk with your doctor and your family to make sure you all have the proper diagnosis of hemochromatosis. The good news is that there are excellent treatments for hemochromatosis that, if started early enough, are highly successful in controlling the condition of too much iron and potentially highly successful in reversing symptoms and improving overall health. Conventionally, the primary therapy is phlebotomy, venesection or blood donation. This is absolutely the best way to "de-iron" an individual. Medicines are available for those who are not able to tolerate phlebotomy. The great news is that there are MANY other recommendations that can be helpful in addition to the medical treatments. This is where Hemochromatosis Help can support you! Diet and supplementation strategies can really enhance your health and wellness as a complement to your medical care. 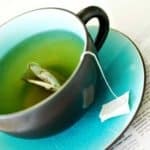 In fact, clinical research has shown many potential health benefits of natural and holistic remedies for iron overload. With that in mind, let's really get to know how to holistically help hemochromatosis. My name is Eric Lewis, and I am a Naturopathic Doctor. Like you, I also have a genetic predisposition to iron overload. My approach to hemochromatosis is holistic, integrative, and hopefully fun! My goal is to integrate the best ideas of science with the art of holistic healing. My wife Kristina and I are both Naturopathic Doctors, and we share a holistic mindset when it comes to health and well-being. In our practice, we work with all of our patients to help them understand their condition and to feel better naturally. We hear people's stories... their successes, their failures, and their questions and struggles. As a husband and a father with hemochromatosis, I want to know as much as I can about the subject so I can live a long, healthy, and happy life. I'm certainly trying my best to walk the walk! 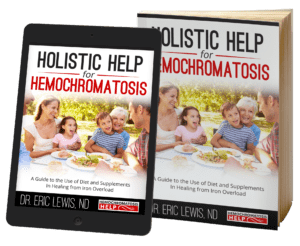 When I discovered I had hereditary hemochromatosis and founded this website, Kristina also became very involved in researching, writing, and teaching about this condition both as a health-care practitioner and as a concerned wife. Our goal with this site is to assimilate, synthesize, and deliver the best information about diet and supplementation strategies for iron overload to you in a clear, easy-to-understand, and friendly way. Hemochromatosis can be scary, lonely, and intimidating. As a Naturopathic Doctor with a predisposition for the condition of iron overload, my aim is to help you learn the safest and most effective diet and supplement strategies to help support your health. I’ve realized there is a lack of clear information out there to help empower people with iron overload to take charge and to learn how to live a healthier life with hemochromatosis. 1. 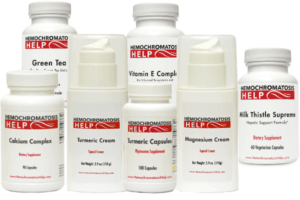 The Hemochromatosis Help Newsletter - 20+ in-depth & empowering articles with actionable tips that will help assist you on your journey with hemochromatosis. 2. 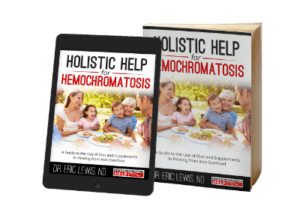 Holistic Help for Hemochromatosis Book (by Dr. Eric) - A complete guide to the use of diet and supplements in healing from iron overload. Available as a paperback and also as an instant-download e-book. 3. Cooking for Hemochromatosis Cookbook (by Dr. Kristina... Coming Soon!) - Recipes, menus, and culinary strategies to lower iron in your diet. Available as a paperback and also as an instant-download e-book. 4. 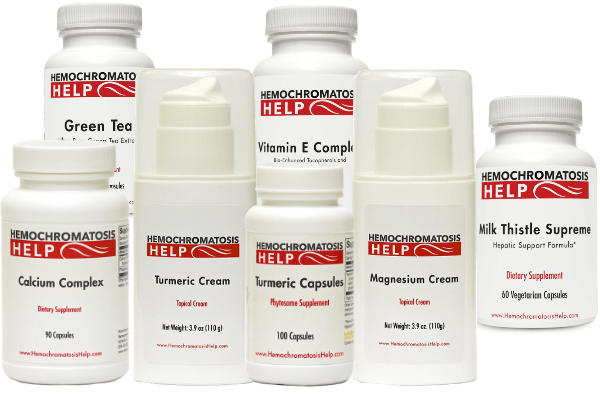 MyHemochromatosisHelp.com - Online store offering safe, effective, and unique supplements specifically designed to support the health of individuals with hemochromatosis. In 2012, he founded the website HemochromatosisHelp.com to share with the rest of the world what he has learned about iron overload. Dr. Lewis is an honors graduate holding a Doctorate in Naturopathic Medicine from the Southwest College of Naturopathic Medicine. He is in private practice with his wife, Kristina (also a naturopathic physician), in Asheville, North Carolina.